Screenshot of YouTube video with 3D options. 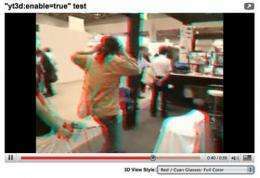 (PhysOrg.com) -- Back on April 1, Google instigated a prank that allowed users to see an effect on Google Chrome that looked like 3D. It was actually pretty cool. But it seems as though that wasn't the only foray into 3D for Google. Apparently, the folks at Google have a "thing" for 3D. One of Google's developers, has been working on creating a 3D effect for videos. The guy that claims to have created a way to add a 3D effect to older videos is "YouTube Pete". He has been playing around with adding tags that can create a 3D effect. He is working on the project as what Google calls a "20% project", which means that it is something that the developer wants to do for whatever reason. It isn't a company priority; it's just something that "YouTube Pete" thought would be fun. It's an interesting project. Other people have been using the tags provided by "YouTube Pete" to create their own 3D videos. When you watch one of these videos, you can see a drop down menu that lets you choose what kind of 3D glasses you have for best effect. Of course, the video isn't perfect, but it is in 3D. "YouTube Pete" is willing to accept feedback, and tinkers with the project when he has the time. You should note, though, that it only works on the YouTube site. We tried to embed a video here, and the 3D effect doesn't carry over (see below). As 3D movies begin to make their comeback, and as some television manufacturers begin to offer high-definition 3D TVs, it is possible that this is the wave of the future. Of course, you still need those crazy glasses to get the effect. The stereogram works well.. was it really created from a single camera video? If so that is quite the invention.